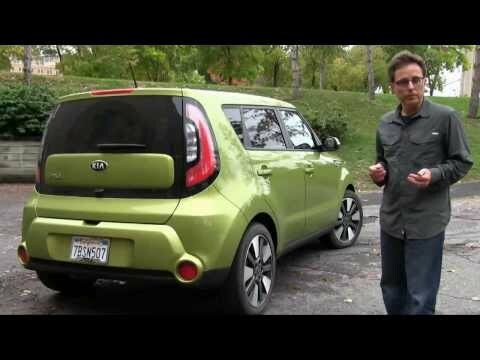 If you need proof that a single vehicle can be cool, cheap and practical, just look to the Kia Soul. With a sub-$16,000 base price, cheerful styling and a radically improved interior, the new-for-2014 Kia Soul is an exceptionally strong choice in the cute, compact-box category of vehicles. Kia Soul has style and comfort that will not break the bank! So far, I love my Kia Soul. Even though it is a compact car, they've found ways to really give passengers space inside. There is enough room to go on vacation with a family of four packed all inside. In the trunk area, there is even extra space under the flooring. There's not a ton of power behind the car. I feel like I am really pushing it to make it up steep hills. Also, the gas tank does not hold a lot. I feel like I am stopping at the gas station constantly. Good thing is, I can fill up my tank for about $23 in my area. It has a nice sound system. It plays CDs, has mp3 and USB ports, and also has a jukebox mode that allows me to save songs from CDs directly to my car. Also, the speakers in the doors have lights around them that change colors. I love it! I would definitely recommend a Kia Soul to anyone that is looking for something cool and comfortable that will not break the bank. It is a fast car on the road and light. to many recalls on this year's model, but I do love the car. It does run good and I believe in keeping a vehicle well serviced. It has done quite a bit of cross-country running and I have not had any problems with the long drives. Unfortunately no one wanted to get behind the wheel of my car because of the following problem, so I ended up doing all of the driving. I was having a problem with breaking when the car stopped, even though I kept complaining to the dealer and Kia nothing was done. When they did a recall this year to fix the steering column for the second time, that seems to have fixed the problem. But the recalls on this model were a bit annoying, there were just to many of them. They put the car on the market and than they decided they would fix along the way. We love our Kia Soul it is a great little car! We purchased our Kia used with low mileage. We were actually looking to purchase a small SUV and decided to test drive the Soul. We were so impressed that we bought it. The car looks small but it has a roomy interior. We have taken it on long trips and it is very comfortable and rides great. It sits high enough that makes it easy to get in and out of. The car drives and handles well. Gas mileage is good. The car has great pick up and keeps up on the interstate and has no trouble with the hills and mountains. No long after we bought it the engine light came on. Our mechanic said it was a sensor. Someone put gas in with the engine running. We highly recommend the car and will consider a second one when we're bready to trade our Mazda. Kia Motors America (Kia) is recalling certain model year 2014-2015 Soul and Soul electric vehicles manufactured July 21, 2013, to January 8, 2015. A section of the accelerator pedal may bend and fracture. If the vehicle has a bent or broken accelerator pedal, the driver may have difficulty accelerating the vehicle, increasing the risk of a crash. Kia will notify owners, and dealers will add a supporting rubber underneath the pedal stopper, free of charge. The recall began on March 24, 2015. Owners may contact Kia customer service at 1-800-333-4542. Kia's number for this recall is SC116.